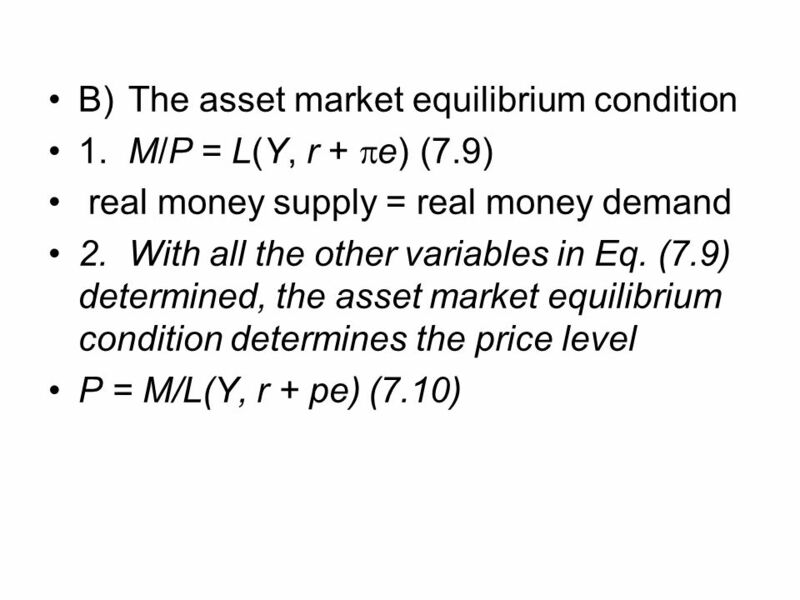 A)	Asset market equilibrium—an aggregation assumption 1. 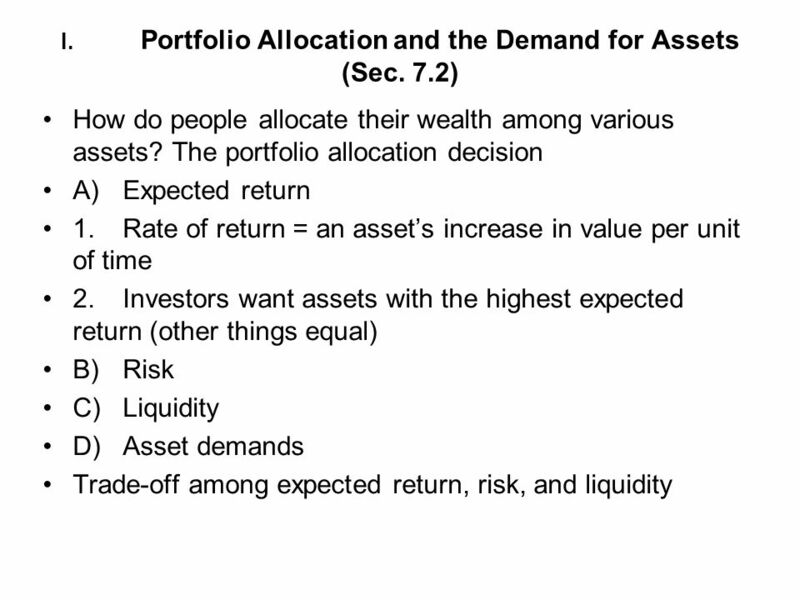 Assume that all assets can be grouped into two categories, money and nonmonetary assets a. 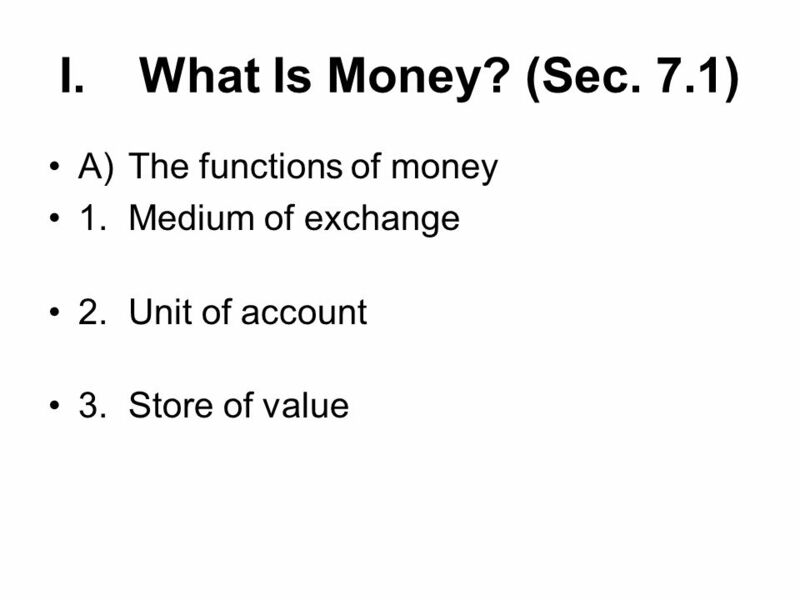 Money includes currency and checking accounts b.	Nonmonetary assets include stocks, bonds, land, etc. 2. 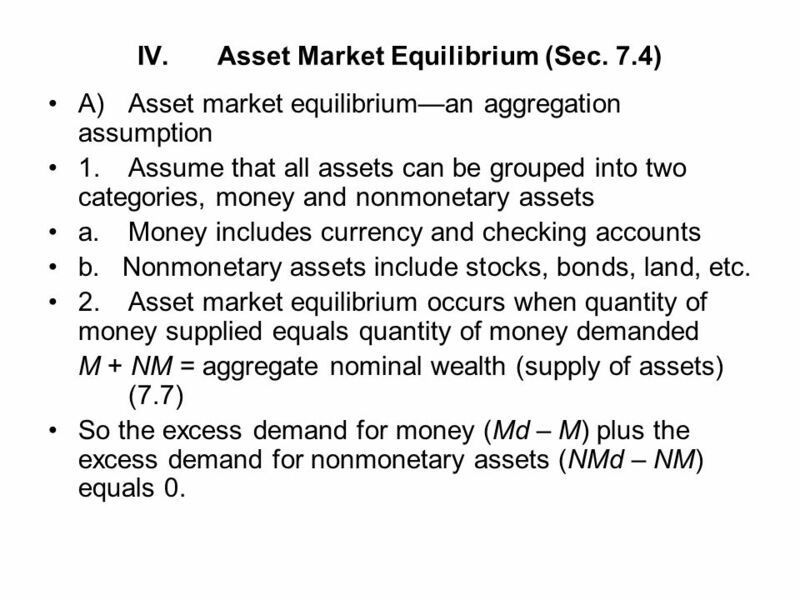 Asset market equilibrium occurs when quantity of money supplied equals quantity of money demanded M + NM = aggregate nominal wealth (supply of assets)	(7.7) So the excess demand for money (Md – M) plus the excess demand for nonmonetary assets (NMd – NM) equals 0. 1. Though the countries of Eastern Europe are becoming more market-oriented, Russia and some others have high inflation because of rapid money growth 2. 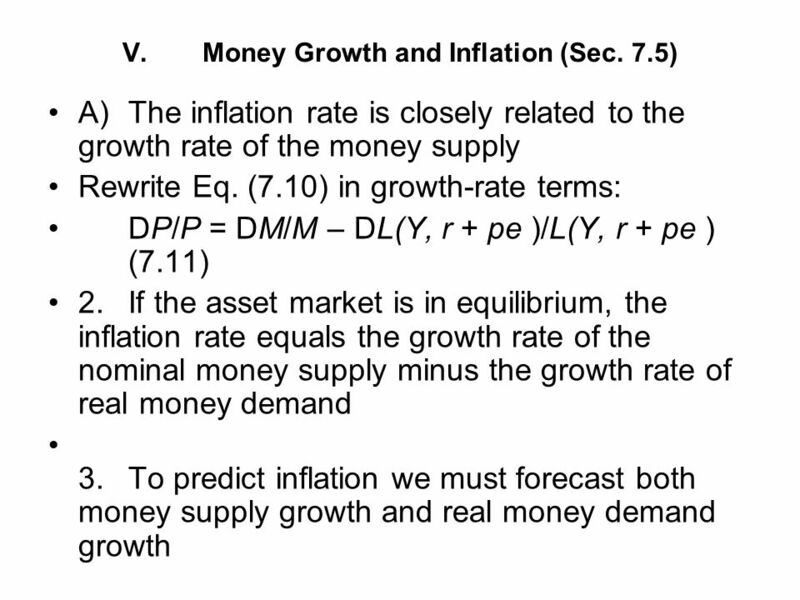 Both the growth rates of money demand and money supply affect inflation, but (in cases of high inflation) usually growth of nominal money supply is the most important factor 3. Figure 7.3 shows the link between money growth and inflation in these countries; inflation in clearly positively associated with money growth 4. So why do countries allow money supplies to grow quickly, if they know it will cause inflation? 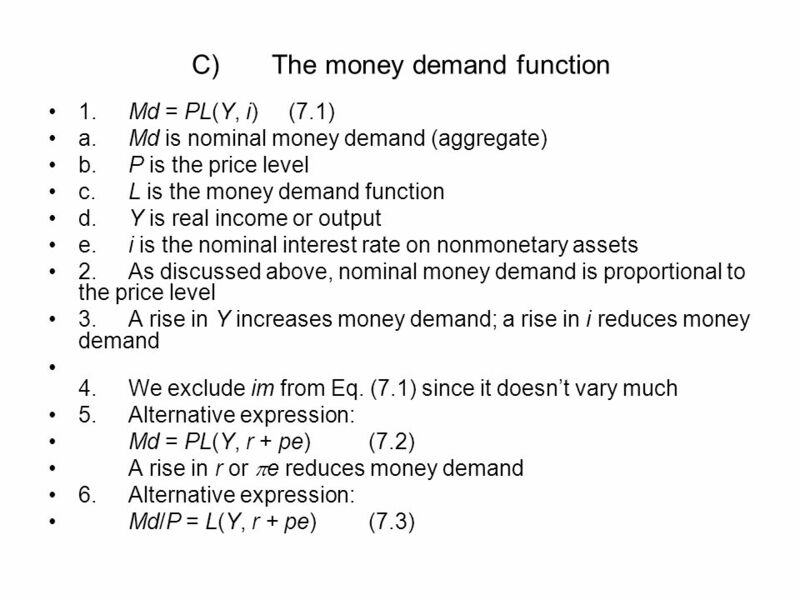 Download ppt "The Asset Market, Money, and Prices"
Money and Inflation An introduction. 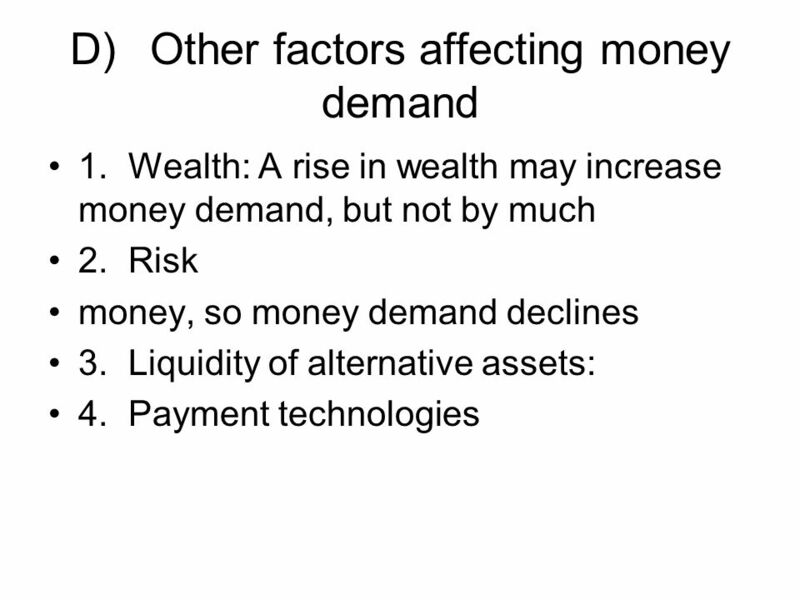 The Demand for Money Theories and Evidence. Chapter 36 - Lipsey. FINANCIAL ASSETS WealthBonds Interest earning assets Claims on real capital Money Medium of exchange. What is money? Money is a generally acceptable liquid asset that could be used to discharge liability. 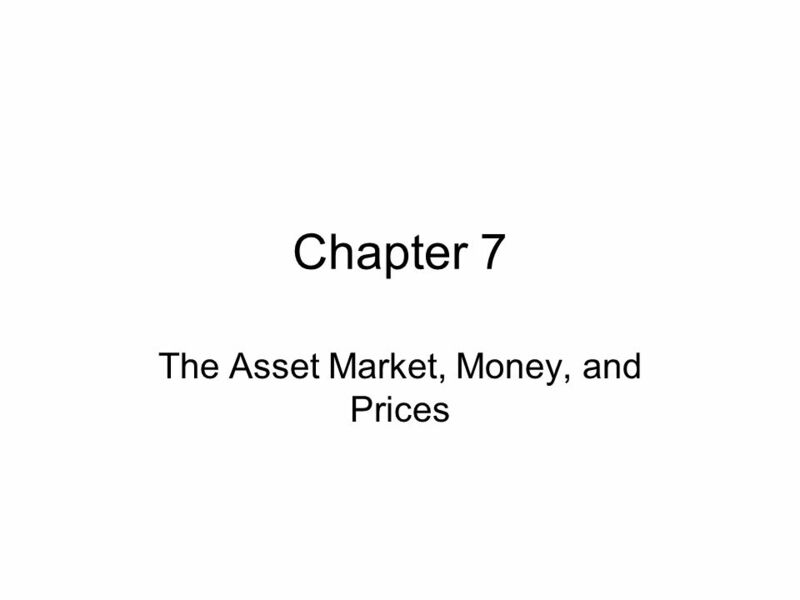 Chapter 7 The Asset Market, Money, and Prices. Copyright © 2005 Pearson Addison-Wesley. All rights reserved. 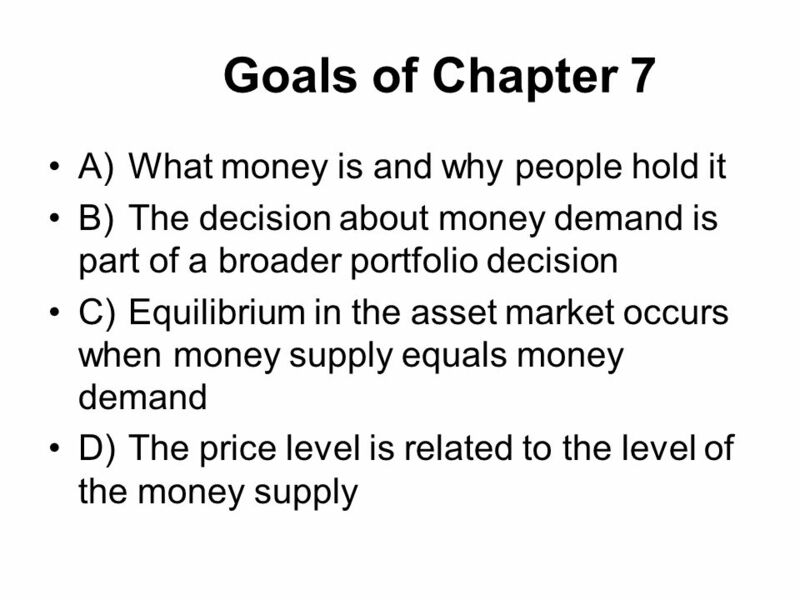 7-2 Goals of Chapter 7 What money is and. 25 MONEY, THE PRICE LEVEL, AND INFLATION © 2012 Pearson Addison-Wesley. Copyright © 2012 Pearson Addison-Wesley. All rights reserved. 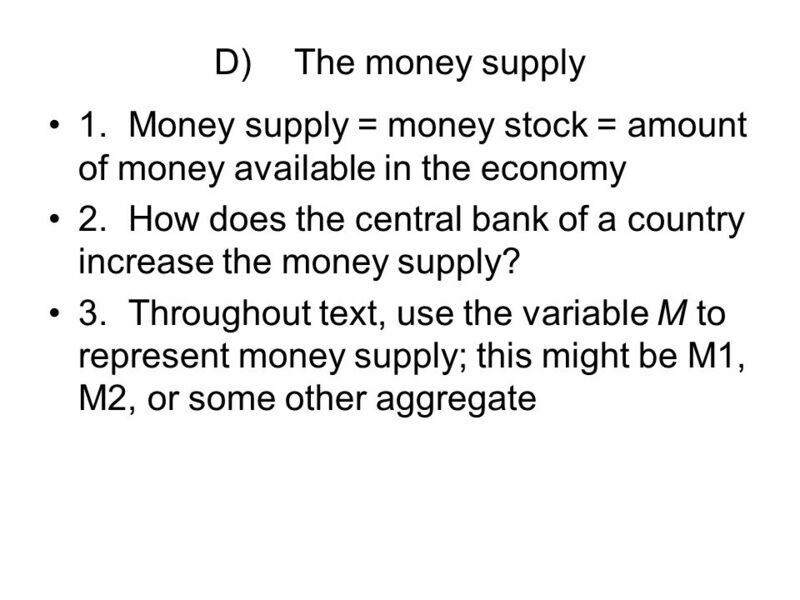 Chapter 10 Monetary Policy and Aggregate Demand. Lecture notes Prepared by Anton Ljutic. 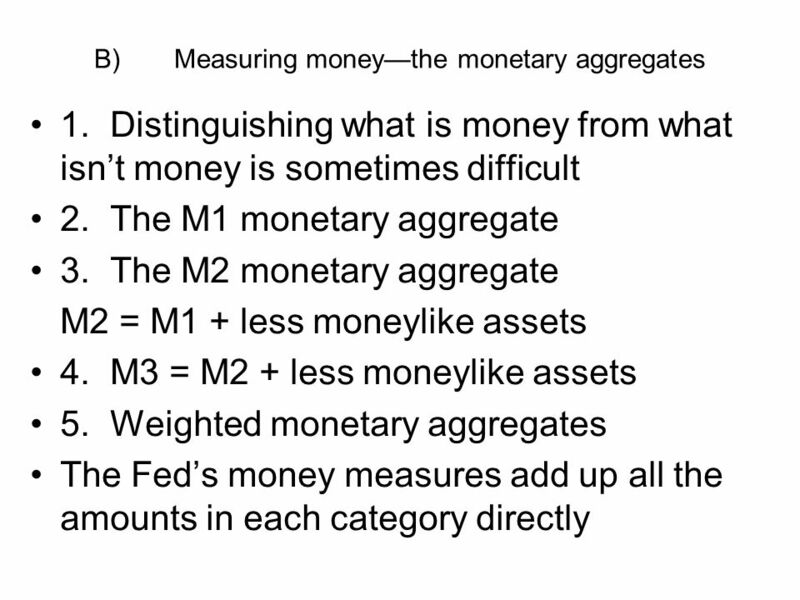 © 2004 McGraw–Hill Ryerson Limited The Money Market CHAPTER EIGHT. Chapter 15 Money, Interest Rates, and Exchange Rates November 2011. 1 Chp. 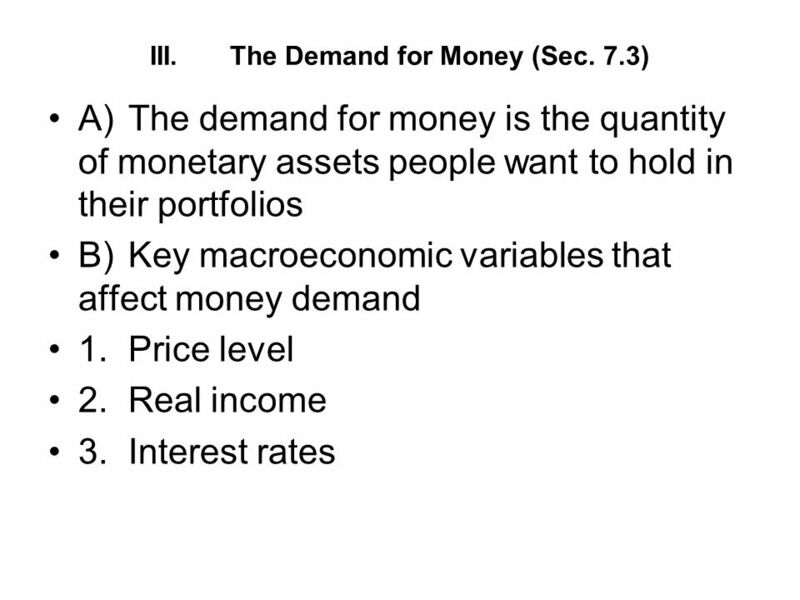 7: The Asset Market, Money and Prices Focus: Equilibrium in the asset market Demand and Supply of Money Quantity Theory of Money. 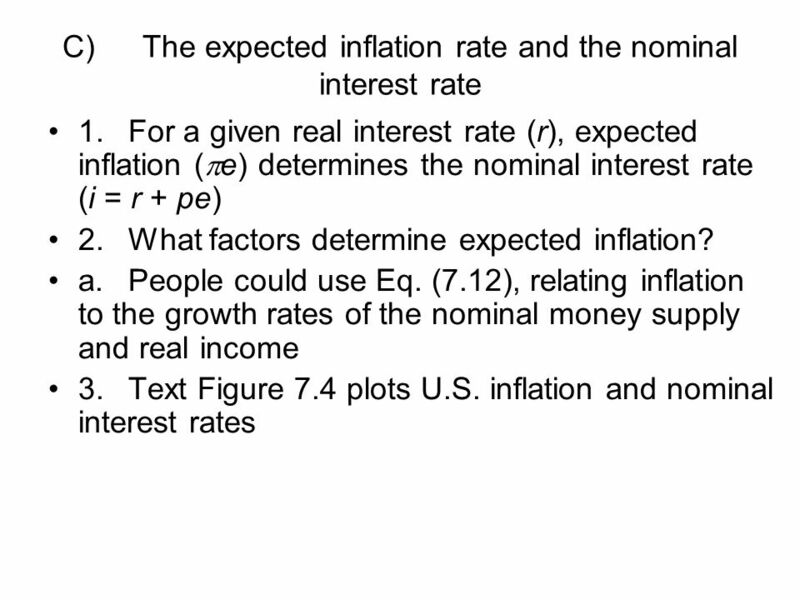 Chapter 15 Money Interest Rates and Exchange Rates. 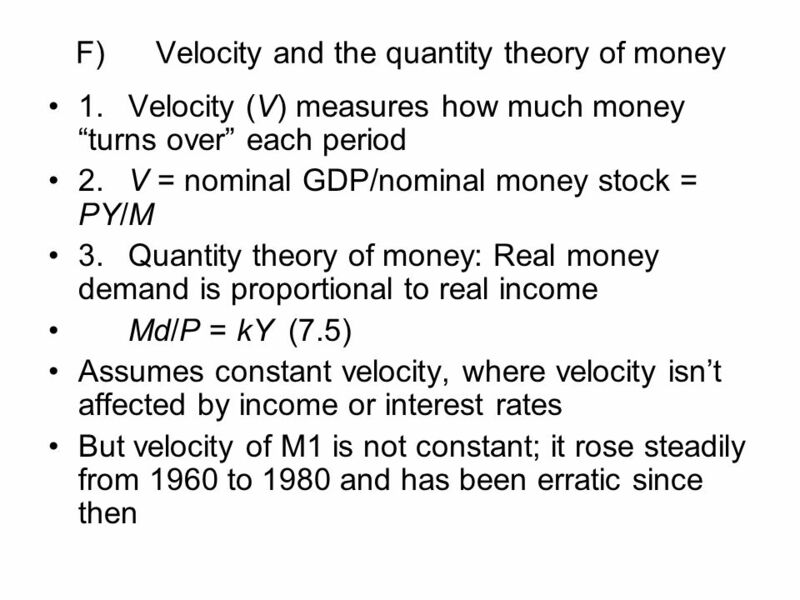 1 Monetary Theory and Policy Chapter 30 © 2006 Thomson/South-Western. Copyright © 2002 Pearson Education, Inc. Slide 24-1. Copyright © 2010 Pearson Education. All rights reserved. 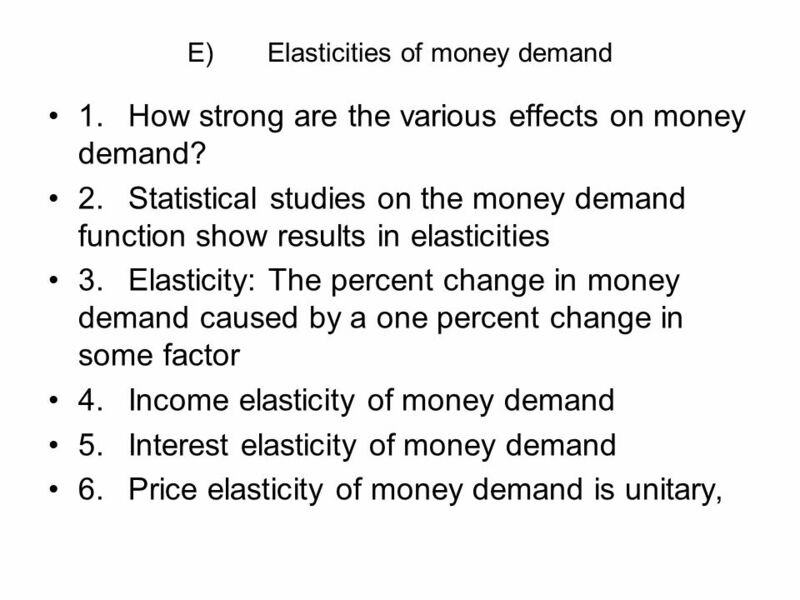 Chapter 19 The Demand for Money. Copyright © 2009 Pearson Addison-Wesley. All rights reserved. 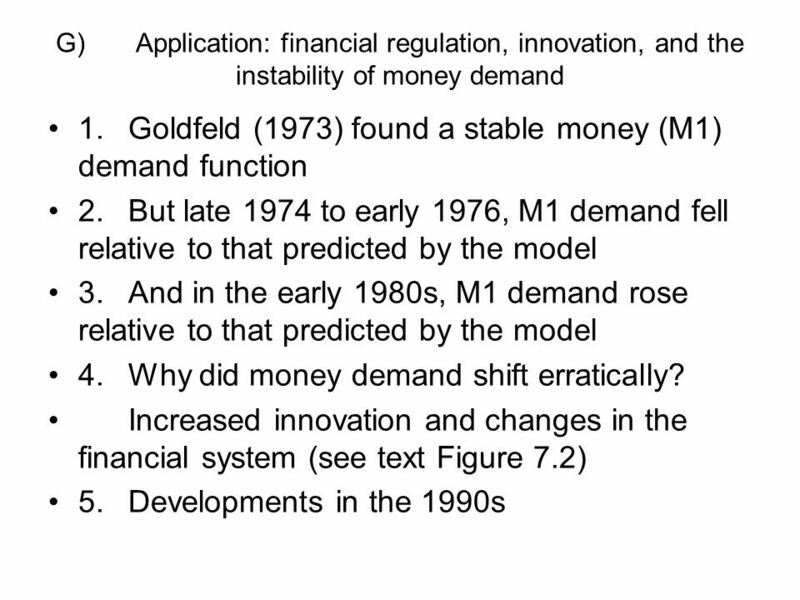 Chapter 4 Monetary and Fiscal Policy in the IS-LM Model.